A weighing system from the Accuweigh line of weigh hoppers was recently installed by their Brisbane South branch for Macadamia Australia’s processing plant at Dunoon in Northern NSW. The weigh hopper scales comprise of a set of four heavy duty load cells and a digital weight indicator certified for trade use. 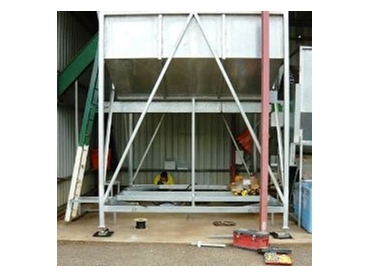 Featuring a weighing capacity of 6,000kg using divisions of 2kg, the weigh hopper is used to process payments for local growers towards the weight of macadamia nuts received for processing. A serial printer is connected to the weigh hopper’s digital weight indicator for printing legal-for-trade weight tickets to ensure hard copies of grower deliveries of macadamia nuts are retained. The hopper’s legs were customised to accept the 4 x 2t heavy duty load cells and load cell mounting kits, which were then bolted to the concrete slab to ensure the industrial scales were rigidly mounted. The load cell cables were run in flexible conduit to the summing box and then onto the Accuweigh 5000 digital weight indicator to generate the industrial scales weight readings.